Joanna Laura "Anna" (Harbaugh) Weyant was born on March 12, 1863 on a farm at what is now Clairton Lake near Scullton, Somerset County, PA, the daughter of David and Mary Magdalene (Whipkey) Harbaugh. On March 4, 1888, at the age of 25, Anna married 23-year-old Curtis Freemont Weyant (1865-1915), son of Simon and Sarah (Yates) Weyand. Their marriage is recorded in fancy but fading handwritten script in the old Harbaugh family Bible. Sometimes Curtis' middle name also has been listed as "Freeman." The Weyants had two children -- Lucy Etta Riley and James Edgar Weyant, seen above in an unusually informal portrait for that era of photography. 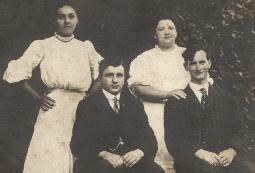 Joanna and Curtis (seated, left), in a family photo with her parents and an uncle/aunt. In the image seen at right are, seated left to right: Curtis and Joanna with an unknown child; Joanna's aunt Rebecca (Whipkey) Miller, and Joanna's mother Mary Harbaugh. Standing, left to right: daughter Lucy, son James, uncle Isaiah Miller and father David Harbaugh. Shortly after marriage, Anna wrote a short poem in the autograph book of her sister Letitia Stoner. The handwritten page is seen at the end of this biography. 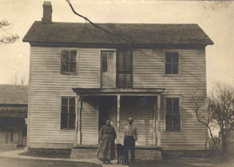 Circa 1900, the Weyants lived in Upper Turkeyfoot Township, Somerset County, where they were farmers. Later, they made their home at Humbert, Somerset County, a town that was built to house employees of lumbering and coal operations. For all intents, the town no longer exists, and its foundations are covered by grassy fields. By 1910, their home was in Somerfield near Addison, Somerset County, in the vicinity of the National Road (today's Route 40). That year, according to the federal census, Curtis had no employment. When daughter Lucy was married in 1914, she stated Curtis' occupation as "stationery engineer." Curtis Weyant and his niece Iva (Conn) Henry feed his livestock. Photo by Davis Studio. Curtis was afflicted with a form of arthritis that deformed his bone structure, and he also suffered with spinal problems. As a result, he was forced to walk with canes. In the photo on this page, he walks holding a cane in each hand, standing beside his wife's niece Iva (Conn) Henry. 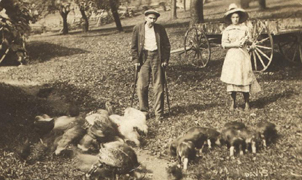 In the card, Iva wrote to a cousin: "Here is me and Uncle Curt feeding the turkeys and pigs." The Weyant home in or near Addison is seen here. Both Curtis and Joanna died relatively young. His body wracked by his arthritis and spinal problems, he passed away at the age of 50 on Oct. 5, 1915. He was laid to rest in the Scullton Cemetery. Joanna outlived her husband by two short years. At age 54, she died on Oct. 28, 1917. The cause and place of her death have not yet been determined. A search of the local newspaper, the Meyersdale Republican, and of the neighboring Connellsville Daily Courier, failed to find obituaries for either Curtis or Joanna. Daughter Lucy Etta Weyant (1888- ? ) was born in 1888 in Kingwood, Somerset County, PA.
On Aug. 20, 1914, she married farmer Edward M. Riley (1888- ? ), a native of Maryland, and the son of George D. and Mary R. (Friend) Riley. The ceremony was performed in Somerset by Rev. S.G. Buckner. 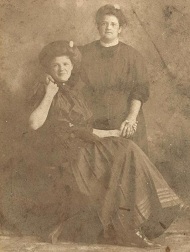 Lucy and Edward had two known daughters -- Ruth L. Riley and Geneva A. Riley. They resided on the Riley home farm at Accident, Garrett County, MD in 1920, when the federal census was taken. That year, Edward's widowed father lived under their roof. In 1930, they remained in the dwelling on their farm in Accident. Lucy is known to have attended her grandmother Harbaugh's 94th birthday party in August 1926. The gathering was so well attended that it became the first Harbaugh Reunion, an event which is still held today. In 1936, Lucy is known to have attended the Harbaugh Reunion at the Kingwood Picnic Grove in Somerset County, and is pictured in a large group photograph taken that day. Nothing more of their lives is known. Daughter Ruth L. Riley (1922- ? ) was born in 1922 in Garrett County, MD. Daughter Geneva A. Riley (1925- ? ) was born in 1925 in Garrett County, MD. Son James Edgar Weyant (1891- ? ) was born on May 28, 1891 in Kingwood or Markleton, Somerset County, PA.
At the age of 21, James married 22-year-old Mary E. Ringer (1889-1981), the daughter of Urias and Sarah Catherine (Diehl) Ringer of Listonburg, Somerset County. The wedding was held on Aug. 18, 1912, by the hand of Rev. I. Hess Wagner, at the parsonage of the Lutheran church in Somerset. At the time of marriage, James worked as a "setter" in a local sawmill. They had at least three children, Frank E. Weyant, Lena E. Weyant and Clara Weyant. Their home in 1915 was in Scullton. By 1920, the Weyants had relocated in North Versailles, Allegheny County, PA, on Oakdale Road. That year, the federal census shows that James' employment was as a motorman on a street railway (streetcar). Circa 1930, they resided on Punta Gorda Street in East McKeesport, Allegheny County, PA, an industrial suburb of Pittsburgh, where he continued to be a streetcar motorman. As the Great Depression loosened its grip on the nation, the Weyants moved to Warren, Trumbull County, OH in about 1942, during World War II. There, James obtained work at the Ravenna Arsenal of the Lordstown Ordnance Depot. They lived at 1512 Mitchell Drive and remained there for years. In his mid-50s, James began to suffer from heart disease. Sadly, James passed away in Warren on Nov. 13, 1949, at the age of 58. The cause of death, according to his official Ohio death certificate, was "coronary sclerosis" with "diabetes millitus" as a contributing factor. A brief obituary was published in the Connellsville (PA) Daily Courier on Nov. 16, 1949. His remains were returned to Somerset County for burial in the Addison Cemetery. Mary outlived her husband by more than three decades. She remained in Warren, where she spent the rest of her life. She died on March 16, 1981, at the age of 92, and her remains were returned to Addison for burial beside her husband.